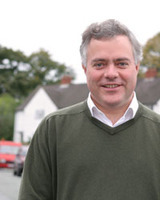 James Gray has secured his position as the Conservative MP/candidate for North Wiltshire today after local Party members voted in his favour, despite him spurning his cancer-stricken wife. The question mark over Gray's future has deeply divided the local association, with talk of a rival candidate standing against him if he was reselected. If this threat was followed up - with funding from the jilted husband of the woman Gray had an affair with - his 5000 vote majority over the LibDems would look very precarious. The Wiltshire North category of Seats and Candidates posts covers all the ins and outs of this saga since Gray was initially deselected in November. Deadline for applications is 2pm on 15th February. "Following a decision by the Board of the Party, the following additional process will now be incorporated into the Selection Guidelines for Conservative held and Target seats. This will take immediate effect. "An association may choose to select from the full list of approved Conservative Candidates. In this case there will be a requirement that at each stage of the selection process at least 50% of the candidates being considered are women. If a constituency association makes this choice, the vacancy will be advertised to the full list. However, a constituency remains free to choose to interview only priority candidates in which case they should make this known to the Regional Director. A constituency can then choose to use either the primary or 'big event' selection process in either of these scenarios." "The Priority List has helped us to make significant progress and so far nearly 40% of selected candidates are women but we can still do better. The new option toughens up the rules on women, and allows more candidates to apply for seats in their regions. Associations would need to agree that half the candidates at each stage of their selection process will be women. In such cases, the vacancy will be advertised to the full Candidates List. The Priority List will remain an option for Associations. If the party Board approve this proposal, then in future Associations will be offered this option."" The selection evening is at the Polish White Eagle Club (map) on Tuesday 13th February. Call 020 8944 0378 to register. There's another James Gray story in this morning's Mail on Sunday. This story involves ConservativeHome with the MoS' Simon Walters reporting Sarah Gray's disappointment at her estranged husband's decision to post a letter of complaint to the Press Complaints Commission on this website. In the MoS Mrs Gray accuses the embattled MP of trying to play down her cancer. This latest story is unlikely to affect Mr Gray's fate. The result of the all-members ballot will be announced on Tuesday. Mr Gray made a case for continuing as Wiltshire North's MP here. He has also won the support of big-hitting MPs Michael Howard and Patrick McLoughlin. 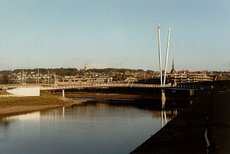 Related link: Politics Show South West report. David Cameron has today responded in written form to my WebCameron question on the costs of being a candidate. Thanks to all who voted. "You're right in saying my ambition is for our Party to be representative of modern Britain. We cannot be so without ensuring that our candidates include men and women not just from the public and voluntary sectors but from all over Britain. And while we have made progress, there is much to do - not just for Parliamentary candidates but in choosing council candidates and increasing our membership and supporter base. I've spoke to Francis about your three suggestions to help attract a wider range of candidates. First, he has agreed that the fee for the Parliamentary Assessment Board, where there are compelling cases, can be reduced on a case by case basis. In fact this is something that has happened in the past. Second, we'll give some serious thought to your emergency access fund. I like the idea. If possible we should do it. I'm not promising anything immediate, but I'll see what we can do. Third, instead of a ‘Candidate's Protector', which seems a little bureaucratic, we already have in place ‘MP Mentors' who guide and counsel candidates. I'll make sure John Maples gets Mentors to monitor financial demands placed on candidates. Campaign Directors are in place working on Target Seats. They are the best placed people to advise candidates and associations on how time and money should be prioritised." I'm not convinced that aspiring candidates would feel inclined to ask for or accept individual subsidies for their PABs, but David's answer shows that the issue is at least being thought about. ConservativeHome will be following these points up with Francis Maude. Associations to be forced to select from gender-balanced shortlists? Andrew Grice has a good scoop about selection procedures in today's Independent, if not a very good understanding of the current system. It looks like everybody on the candidates list, not just the priority list, will soon be able to apply for any seat - and be able to try and prove their local credentials. This addresses an issue often raised here that although Associations can recommend non-priority local candidates that they know, candidates themselves are kept out of the loop on selections in seats that they may have strong local connections with. Unfortunately this sensible amendment is accompanied by a more controversial proposal: to make it mandatory for final shortlists to include two men and two women. This would close the so-called "loophole" of Associations being able to choose all-male shortlists for open primaries. It's not clear at this stage how rigid this would be. What if two female candidates can't be found? What if the Association wanted to shortlist three females - would the Association still have to shortlist two men? The Party Board will have to approve these changes next week but it's unlikely that the representatives of the voluntary Party will knock it back. 50% women shortlists aren't as disagreeable as all-women shortlists, but many of the arguments against the latter such as "the Widdecombe critique", are still applicable. "Deputy party chairman John Maples, who is responsible for candidates, said: "The Priority List (A-list) has helped us to make significant progress, and so far nearly 40% of selected candidates are women, but we can still do better. The new option toughens up the rules on women and allows more candidates to apply for seats in their region." The proposal is likely to be seen as a defeat for the 'A-list' system, intended by Mr Cameron to ensure more women and ethnic priority candidates were selected for winnable seats. It has proved highly controversial among local constituencies that deeply resented having candidates imposed on them from party headquarters in London." Local Councillor Mark Pawsey pipped Maggie Punyer and Samantha George to the post in Rugby's open primary. The new seat has a notionally very slim Conservative majority. This evening's Wirral South open primary (yet another orchestrated by North West Conservatives) chose Jeff Clarke, former LibDem candidate for Wirral West, to fight the winnable Labour majority of 3,724. Jeff is a barrister in Liverpool and Councillor in Chester. Today's Telegraph Spy confirms that James Brokenshire (MP for Hornchurch, a seat now split into three others) is challenging Angela Watkinson (MP for Upminster) for the new seat of Hornchurch & Upminster. New MP Brokenshire also admits that he is seeking the Hampshire East nomination. "Throughout last year ConservativeHome examined the high cost of being a Conservative parliamentary candidate. We estimated that it costs an average £41,550 to become a Conservative MP. That price tag must prevent many lower income candidates from being able to become Tory MPs and will frustrate your ambition to build a parliamentary party that is truly more representative of modern Britain. People with valuable experience of the public and voluntary sectors are particularly likely to be affected, as are those of a working-class northern background similar to my own. This costs issue has also recently been raised by Women2Win as something that deters some would-be female candidates. ConservativeHome has come up with few ideas, such as reducing the costs of attending a Parliamentary Assessment Board, establishing an emergency access fund for candidates in crisis and appointing a ‘Candidate’s Protector’ to limit the demands on candidates from their Conservative Associations. What action might you take in order to address this important issue of financial exclusion?" James Gray's battle to keep hold of Wiltshire North was apparently dealt another blow by this morning's story in the Mail on Sunday and its sensationalist 'Tory MP's dumped wife forced to seek work as a cleaning lady' headline. But ConservativeHome has learnt that Mr Gray will take the MoS to the PCC tomorrow - in protest at alleged inaccuracies in the story as well as its intrusive nature. Sarah Gray herself is consulting solicitors over some of the article's content. Jake Berry was selected from the shortlist for this winnable seat yesterday. Its Association was one of the first to use the "speed-dating" method of selection, whereby the 70 or so members who turned up in the morning were split up into several tables with the candidates moving around each of them individually. Later on there was a vote of all those present after a general Q&A session (with the members effectively being co-opted onto the Exec for the day). 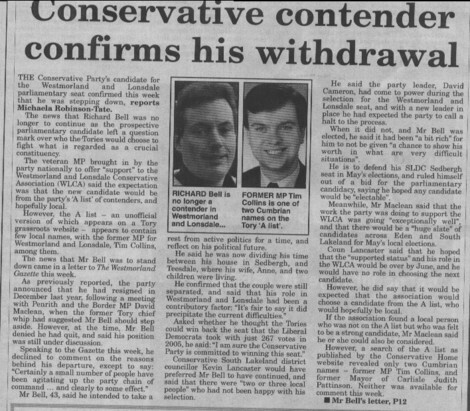 ConservativeHome reported on the controversial 'resignation' of Westmorland and Lonsdale candidate Richard Bell early last month. 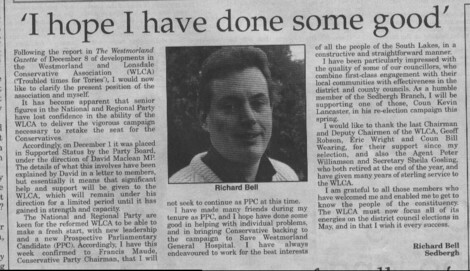 Mr Bell has now written an open letter to the Westmorland Gazette graciously confirming the fact that he is no longer the adopted Tory candidate and wishing the W&L Association well. A scan of that letter and an associated report are published below (both from the Gazette). Click on either graphic to enlarge. Rory Malone, an activist in Westminster North, has been meticulously compiling a database of the candidate selections covered on ConservativeHome. It includes lists of constituency selections, broken down into graphs and tables showing the proportion of A-listers and women being selected so far. I'm sure many of you will find it useful, and will be thankful for the time Rory has put into this. We hope to be able to publish updated versions in the near future. Please feel free to send him any corrections and additions in the meantime. The selection held yesterday followed the trend of most Yorkshire area selections by choosing Cllr Alec Shelbrooke - local non-A listers trumping non-local A-listers. Julie Moody, the runner-up who hails from York, knows this all too well. Should Conservative MPs be reselected each term? Since the results of December's survey were published, there has been some debate about how to select candidates for the next EU elections over on ToryDiary and YourPlatform. "I am rather surprised that your survey did not also invite opinions among your correspondents on whether sitting Conservative MPs should also undertake a process of full reselection involving a vote of all Party members in their parliamentary constituencies. All Party members have been able to participate in the reselection process of the current team of Conservative MEPs on two occasions in the past seven years, but the vast majority of Party members in Conservative constituencies have either never had a say in the choice of their Conservative MP or no say in the last 20 years. Having received over 96% of the votes of Welsh Conservative Party members participating in the European selection process in 1999 and 2004, I am perfectly prepared to go through whatever selection process the Board of the Party should decide, but I certainly favour consistency in the selection processes between MEPs and MPs." The idea that MPs should face "proper" reselection contests every four or five years has been mooted a couple of times by ConservativeHome commenters. It's been suggested that new MPs should be reselected automatically (within reason) for their first General Election as the incumbent, but have some sort of contest for each election after that. There are some clear advantages to this system, such as keeping MPs on their toes (especially so-called "bed-blockers") and ensuring that they have the support of Party activists. "James worked for me as my special adviser when I was secretary of state for the environment. He has also worked closely with me as a Parliamentary colleague. I have never been in any doubt of his dedication to the party and, since his selection as your MP, of his hard work for all the people of North Wiltshire." Related links: Full text of James Gray's letter to local members and James Gray accuses his opponents of settling old scores. Philip Allott: Is it time to stop local candidates from applying for target seats? A-Lister Philip Allott, pictured campaigning on the Manchester Metro and who contested Bolton West at the last General Election - cutting Ruth Kelly's majority by 3,000 votes - writes about his experience of attending recent constituency interviews and why further reforms of the selection process could be necessary. In mid-December on a damp foggy Tuesday evening, I attended the Bolton West selection to see Susan Williams and Stephen Ogden battle it out in an open primary. Having fought the seat at the last election and decided not to contest it again due to disappointing boundary changes, I was very interested to view the new selection process from a member's perspective. At the start of the proceedings an area Party Officer read out some instructions concerning what the selection process would involve. He made particular reference to the fact that the Party was very keen to select a more diverse range of candidates and especially women. The meeting was attended by a large number of the local Association's paid up members plus around 15 members of the public. The latter included the former chairman of the Greater Manchester Chamber of Commerce who only the previous year had chaired a debate between Ruth Kelly, Tim Perkins (then Liberal Democrat now allegedly Conservative) and myself. Stephen Ogden was first on and gave the meeting an interesting insight into working in Russia and his love for Bolton Wanderers. Susan Williams who was delayed due to M62 traffic problems was next up. Susan related her experiences as a Trafford Council leader to the problems facing Bolton, which seemed to go down well with those present. Both candidates gave interesting views on Europe and managed immigration. The two candidates gave a good performance but Susan had the slight edge and ultimately won the selection vote. Attending the Bolton West selection made me reflect on the four interviews I have attended since been added to the A list in the summer and how these interviews compared to those in 2004, which ultimately resulted in my previous selection by Bolton West. Current Lancaster & Wyre MP Ben Wallace, elected for the first time at the last election, was selected for the new constituency of Wyre & Preston North this afternoon. The other half of his seat is now part of Lancaster & Fleetwood - a seat for which the Association Chairman had called for any candidates to apply before today's deadline. Well done to Ben, his new seat will have a Conservative majority of at least a whopping 14,000 votes. Wirral South Conservatives are holding an open primary selection on Thursday 18th January. If you are local and want to take part, call 0151 342 5344, email the office or register online (enable cookies on your pc). The changed seat which has a notional Labour majority of under 4000 is selecting its candidate this Saturday. Jake Berry, Graeme Brown, David Mowat, Mary Robinson and Samantha George (recently shortlisted for Rugby) are those in the running. This seat will have a projected Tory majority of 174. Philippa Stroud was selected for the seat of Sutton & Cheam (notional LibDem majority of under 3000) tonight. Tariq Ahmed, Helen Grant and Lynne Hack were shortlisted. The association was said to have responded enthusiastically to her passion for reaching the disadvantaged through her work as Director of the Centre for Social Justice. I'm fairly confident that I can speak for Tim in sending her our heartiest congratulations! The Chairman of Lancaster & Fleetwood Conservative Association is inviting candidate applications to the new seat from anyone capable, irrespective of A list status. "Grim up North? Our new consituency includes the beautiful Lune valley (excellent salmon), moors owned by the Duke of Westminster and by the Queen, Duke of Lancaster (excellent pheasant), the fields of rural Wyre (excellent, er, cows) and the bracing sea air of Fleetwood(excellent sailing). The historic county city of Lancaster has two, excellent grammar schools, and the University (excellent) is home to our secret campaign weapon: Lancaster Conservative Future! We have one of the biggest Green Party votes in the country, so Zac, if you are reading this, are you up for a challenge? We have also just opened a new office as a regional hub to provide training and support to neighbouring Constituencies." Get in touch with Robin (by email or 07771 983 172) as soon as possible, as CCHQ has to have candidate CVs by this Monday. "I cannot pretend that the last few months have not been amongst the worst of my life. I have been dealing with the very personal and sad consequences of the breakdown of my marriage and the hurt I have caused to those I care for most. I am aware that many people have been angered and upset by events in my personal life. It is a fact that my marriage has broken down and that this is in part due to my deep feelings for another woman. That this happened at a time when Sarah was diagnosed with a serious illness, thankfully successfully cured early last year, is particularly difficult. All of this has been made even worse for all concerned by the constant and intrusive, very often inaccurate and sometimes malign press attention. "I do not know why Frank is doing this. He probably finds it exciting because he does not lead a very exciting life." - James Gray in the local press speaking about the former Chairman of the North Wiltshire Conservative Association. The former Chairman has spoken openly about James Gray wasting time and money by trying to hold on to his seat after the Association's Executive chose to deselect him. Mr Gray is sending letters to 800-1000 local members as well as using Association funds for a postal ballot of members which takes place next week with a deadline of January 29th. Mr Gray is probably wrong if he thinks that this ongoing episode is purely down to personal vendettas, as he makes out. Having an affair with a married woman whilst his wife battled breast cancer hasn't done much for his reputation in the constituency. The seat is contended by the LibDems who may make hay with the issue.